AwayGoWe Posts » Asia » Laos » Is Lao Airlines Safe (and Reliable)? Across Southeast Asia, I’ve seen quite a few eyebrows raised over the years whenever “Laos,” “airlines,” and “safety” make their way into the same sentence, which nearly always leads to conversations spouting deep concern (or genuine fear), unfounded assumptions, and wild misinformation about the principal Laos airlines’ safety and reliability. So, let’s look at the facts, and then I’ll discuss my experience flying with Lao Airlines over a dozen times in the past three years. 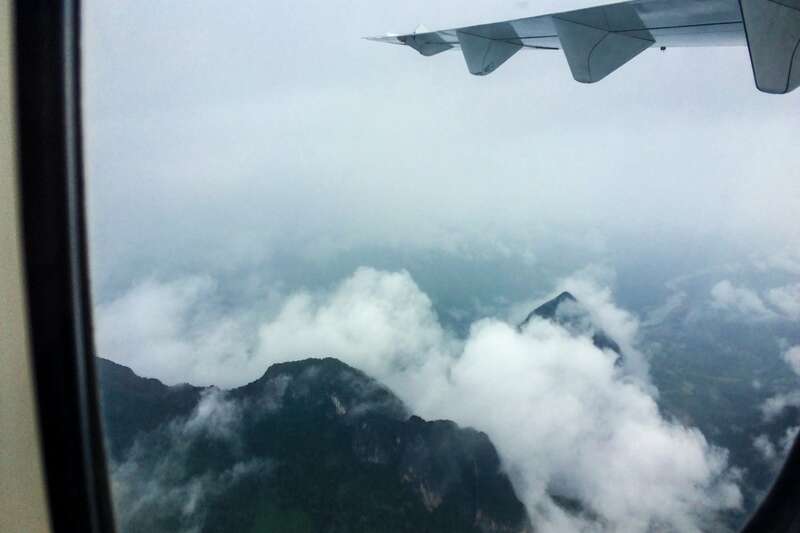 There’s no denying that air safety has a checkered past in Laos, stretching back to the founding of the nation in its current incarnation in 1975 following the Communist revolution. From the 1979 to 2003, domestic routes in Laos were dominated by Lao Avionics. There’s much debate as to whether this was a precursor to the current flag carrier of Laos—Lao Airlines—or a completely separate entity. Regardless, there’s no dispute surrounding the abysmal safety record of Lao Avionics for that quarter of a century. In 2003, Lao Airlines emerged, and in the decade and a half since, has had a superb safety record, save for the high-profile 2013 crash of Flight 301 at Pakse (the cause of the accident was deemed to be a botched second landing attempt in extreme weather related to a typhoon). Whereas the Lao Avionics fleet was dominated by unreliable old Soviet and Chinese aircraft, today’s Lao Airlines fleet is primarily comprised of modern and very reliable workhorses: Several ATR-72-500/600 aircraft and a handful of Airbus A320-200 aircraft plying international routes. While the Lao Airlines website does mention continuing to operate older Chinese-made Xian Y-7 and Harbin Y12 aircraft to remote areas of Laos, I haven’t been able to confirm that this is the case today (and have never flown on one myself). Furthermore, as of 2018, Lao Airlines is NOT listed as a banned or restricted airline on the European Union Air Safety List. Since October 2016, I (along with my wife and young son) have flown 12 legs (8 domestic and 4 between Vientiane and Bangkok). Seven of those flights were on the ATR-72 and the remainder was on the A320. Despite what many people seem to think, the use of turboprop vs. jet airliner isn’t divided strictly along the lines of domestic vs. international, but more so based on passenger volume/demand on routes. Our destinations from/to Vientiane (where we currently live) have so far included Luang Prabang, Xieng Khouang, and Bangkok. We’ve had white-knuckle rides and smooth-as-silk flights, but have arrived safely and generally on time. No matter how good the airline, it would be virtually impossible to avoid turbulence on some routes during certain parts of the year. The terrain throughout much of Laos is quite mountainous, and anyone who has spent time in the tropics knows how severe and unpredictable the weather can be. Additionally, Laos is not an exceptionally large country, so most domestic flights take under an hour. As domestic routes are so short, most aircraft fly between 10,000 and 15,000 feet (especially the ATR-72s), which might be just above the weather, or in it. I’ve found that the airline does a good job anticipating and working around severe weather. If there is a delay, it’s generally weather-related. While nobody likes a flight delay, trust me, a delay related to weather is much preferred to the alternative! Speaking of delays, out of a dozen flights, we’ve only experienced one delay in excess of 20 minutes, which was due to a mechanical issue on the ground. On a couple of occasions, we’ve even left EARLY (once all ticketed passengers had boarded). In terms of comfort and customer service, we’ve always been very pleased with the care we’ve received and the standard and maintenance of the cabins. I was reminded when we visited the U.S. last year just how much I prefer to fly with Lao Airlines than ANY U.S. carrier on a domestic route. Flying with Lao Airlines is Old School (in the best way). Economy passengers currently get one 20kg bag checked-in free (infants, 10kg), and 7kg carry-on (which is largely due to lack of overhead space on the ATR-72). Passengers are ticketed in person at the airport, and leg room on flights is more ample than anything that U.S. carriers have to offer these days. Generally, there’s even a meal or light snack served (like a sandwich and drink), even for flights lasting only 20-30 minutes! And, we’ve always found the cabin crew to be exceedingly friendly and helpful. But if you are still hesitant to fly Lao Airlines…? I understand your concern if the weather is stormy or if you just refuse to believe that Lao Airlines is as good a bet as any airline, despite the figures. Well, flying internationally to/from Vientiane or Luang Prabang, you’ve got a few other airline options, though there’s really no objective measure that I’m aware of that indicates Thai, Bangkok Airways, AirAsia, or any of the others is any better that Lao Airlines. For what it’s worth, we’ve flown AirAsia half a dozen times and have pretty much hated every aspect of our experience with them. 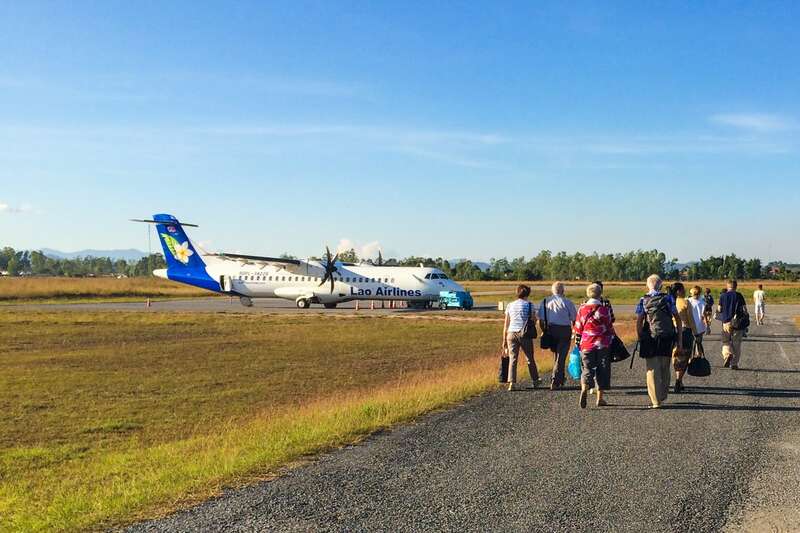 However, most domestic routes are only served by Lao Airlines, so if you want to get around by air in Laos, Lao Airlines has the market cornered. Of course, you can always take the bus (there are no domestic train routes in Laos…yet). I’m a big advocate of slow travel, budget travel, local travel—whatever bus travel symbolizes to you. I’ve spent countless hours of my life (most by choice) on local buses in developing countries. There is simply no better way to see a country than taking local transport. PERIOD. …If you’re worried about safety and some bumps along the way, I’ve got some bad news for you. Ain’t nothing compared to taking an aging Franken-bus for 10-20 hours on some of the region’s curviest and poorest roads over rugged and treacherous terrain…often with an intoxicated lunatic at the wheel. Add a tropical storm into the mix, and you’ve got yourself a real party. Or…you could take your chances for 20-40 minutes in the air with an airline as dependable as any other.